Grande Estates homes for sale include a luxurious active lifestyle along with a fine quality home. 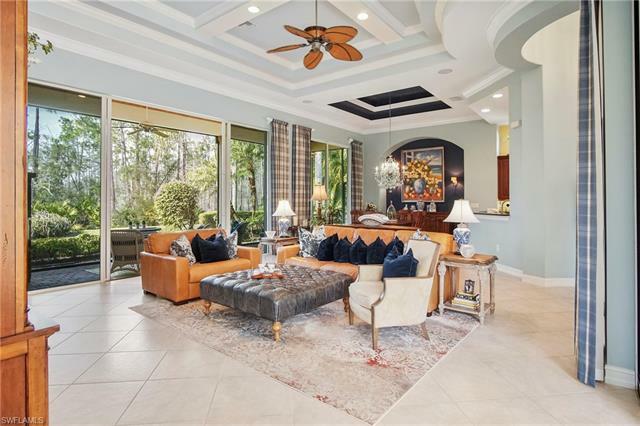 The prime location combines with all the fabulous amenities of a Grandezza community to exceed your expectations for a southwest Florida lifestyle. The private golf course, designed by Darwin Sharp III, is only one of the special features that make Grandezza a most desirable places to live. Water features, natural beauty and abundant wildlife are showcased along the walking paths. There is always something to do in this socially active community from bowling or cards to Mahjongg or the Red Hat Society. Venture out to local entertainment, prime shopping and fine dining in nearby Naples or Fort Myers. Luxury is the watchword for the single family estate homes in this community. Custom homes range from 2,500 to more than 3,000 square feet and include the exceptional quality, fixtures and finishes of some of Southwest Florida’s finest builders. There is a putting green and state of the art fitness center to keep residents fit for all that the community and local area has to offer.